Now, finally EA has released the original and all expansion packs in one neat package at a great price. No longer do I need to keep all those disks, though I probably will for nostalgic purposes. Yes, I am a sims geek and proud of it. If you are new to The Sims, this all-in-one package can make you feel overwhelmed. Rest assured the tutorials are great and you will be simming like a pro in no time. 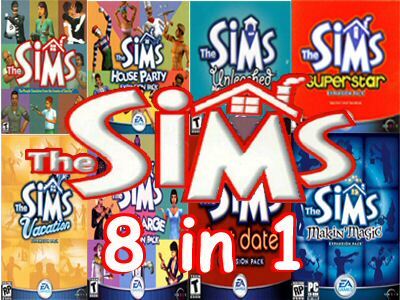 The Sims Complete Collection combines The Sims, The Sims Livin Large, The Sims House Party, The Sims Hot Date, The Sims Vacation, The Sims Unleashed, The Sims Superstar and The Sims Makin’ Magic in one package. With the original hit The Sims you can build and customize your sims’ person and/or family with a variety of different traits, from haircolor to what zodiac sign they are. For each sim you create you chose their career and help them move along the corporate ladder. It is your goal to make sure that they are happy and you have hundreds of objects and commands to help them along. Each expansion pack added many new items, outfits (or skins as they are called) characters, walls, floors, furniture and building tools. The Sims Livin’ Large was the smallest expansion in which you gained The Sims Creator. Use this to create your own sims skins and traits to play in your game. Additionally, new objects and new character outfits, along with new walls and floors to re-decorate your home. 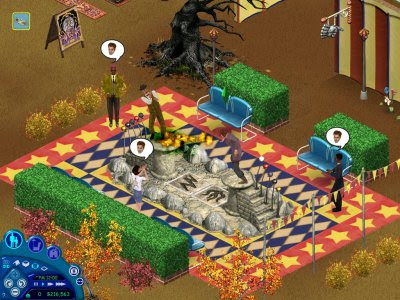 The Sims House Party added the ability to throw parties and invite your neighbors. Over 100 new items, new neighborhoods and a bunch of new characters. There is a Mime that will show up when your party is getting a bit slow, and he will try to entertain your guests. One hilarious character shows up when you buy a cake in which a male or female dancer jumps out dancing and starts flirting to help your partygoers have a great time. You also have the ability to hire a caterer to handle all the food and drinks. The Sims Hot Date added a whole new dimension to your sims life. It added a downtown area in which you can hang out and meet new sims. You just call up a cab and it whisks you away to a Maxis created lot or you can get real creative and create your own hang out. Additionally you have new build mode tools such as grass and water. 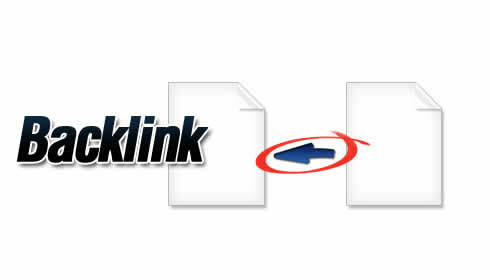 New items abound and now you can easily find what you wish with Maxis adding new sorting categories. The Sims Vacation enables your sims to live life to the fullest. 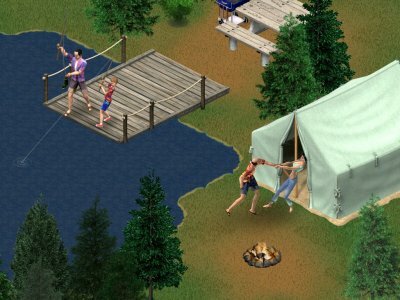 Your sims can now go on vacation to a beach resort, camping in a tent in the woodlands or skiing at a winter retreat. You can send postcards to friends and buy or win souvenirs.